By covalently modifying specific lysine residues in protein substrates, or by non-covalently interacting with proteins, small ubiquitin-like modifiers (SUMOs) play an essential role in the regulation of a variety of biological processes, including gene expression, DNA repair, chromosome assembly, and cellular signaling (Geiss-Friedlander and Melchior, 2007 ;Hay, 2005 ;Muller,et al., 2001 ;Seeler and Dejean, 2003). Along with the accumulating research on its biological functions, there are abundant evidences that the aberrance of SUMO regulation is highly associated with various diseases, such as neurodegenerative diseases (Lee,et al.,2013; Eckermann, 2013), congenital heart defects (Wang, et al., 2011), diabetes (Zhao, 2007) and cancers (Seeler, et al., 2007). Therefore, the identification of SUMOylation Sites and SUMO-interaction Motifs (SIMs) in proteins is fundamental for understanding the biological functions and regulatory mechanisms of SUMOs, and provides potential targets for further diagnostic and therapeutic consideration. The process of proteins being covalently modified by SUMOs is called as sumoylation, which is one of the most important and ubiquitous post-translational modifications (PTMs) of proteins (Gill, 2005; Melchior, 2000). Previously, experimental studies suggested that most of sumoylation sites follow a canonical consensus motif of ψ-K-X-E (ψ, a hydrophobic amino acid, such as A, I, L, M, P, F, V or W; X, any amino acid residue) (Rodriguez, et al., 2001; Sampson, et al., 2001). However, our collective experimental data shows that approximately 40% (400 out of 983 sites) of known sumoylation sites do not conform to the above motif. In this regard, the current understanding of sumoylation recognition is still inadequate. Recently, it was reported SUMOs can non-covalently interact with other proteins through targeting specific SIMs (Hannich, et al., 2005; Hecker, et al., 2006; Kerscher, et al., 2006). For example, the SUMO Interaction of Daxx modulates its sumoylation and is critical for targeting Daxx to PML oncogenic domains (PODs) for the transcriptional repression (Lin, et al., 2006). Also, the non-covalent interaction of SUMO-2 and CoREST1, but not the sumoylation, is essential for organizing the transcriptional corepressor complex of LSD1/CoREST1/HDAC (Ouyang, et al., 2009). Previously, a series of SIMs were experimentally identified (Hannich, et al., 2005; Hecker, et al., 2006; Ouyang, et al., 2009; Minty, et al., 2000; Song, et al., 2004; Song, et al., 2005; Vogt and Hofmann, 2012). Although nearly ten types of SIMs were experimentally identified, each one can only recall a small proportion of known SIMs, and no one can present a major profile for SIMs. Because of these complicated features, systematic analysis of sumoylation and SUMO interaction is still a great challenge. 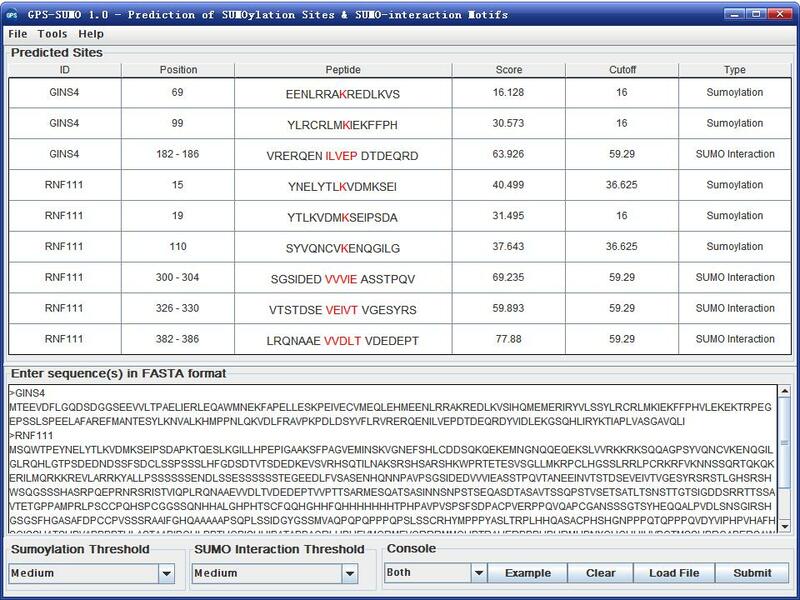 In contrast with labor-intensive and time-consuming experimental identifications, in silico prediction of sumoylation sites and SIMs in proteins can greatly narrow down the number of candidates, and generate helpful information for further verification. This website is linked in ExPASy Proteomics Tools page. GPS-SUMO: a tool for the prediction of sumoylation sites and SUMO-interaction motifs. Qi Zhao, Yubin Xie, Yueyuan Zheng, Shuai Jiang, Wenzhong Liu, Weiping Mu, Yong Zhao, Yu Xue and Jian Ren. Nucleic Acids Research. 2014; 42(W1):W325-W330. Systematic study of protein sumoylation: Development of a site-specific predictor of SUMOsp 2.0.